After a pilot project in Mumbai’s civic dispensaries that screened diabetes for retinal diseases, doctor S Natarajan, president-elect of the All India Ophthalmology Society will now step up the Stop Blindness campaign. Training people — with a minimum qualification of Class VIII — on how to use a hand-held camera for mass screening for retinal diseases and glaucoma, the campaign will be launched across Pune, Nashik, Solapur, Miraj and Sangli. Diabetic retinopathy is a condition that can lead to decreased eyesight or even blindness. “There has been a rise in these cases,” says Natarajan, who also coordinated the first-of-its-kind diabetic retinopathy urban Mumbai slum study under which an ongoing screening is underway to detect and treat such cases. In 2010, WHO had stated that India has 53 million visually-impaired people, among whom 6.8 million are blind and 46.2 million are with low vision. Non-communicable diseases (NCD) , like Type II diabetes mellitus (T2DM) and ensuing diabetic retinopathy (DR) are becoming leading causes of visual impairment in the working age group in the developing world. “In our study that was published in the Ophthalmic Epidemiology Journal in 2017, we surveyed 16,201 households in 23 wards in Mumbai for diabetes and diabetic retinopathy. The population of 69,079 in these households was surveyed and fasting blood sugar tests were conducted. We found 2,066 cases of diabetes and 324 cases of diabetic retinopathy. Follow up visits have started,” Natarajan told The Indian Express. While Natarajan’s team includes community health workers who work in the slums of Mumbai, a diabetes van equipped with a fundus camera and retinal laser machine travels to the interiors of the slums to reach out to the diabetic retinopathy patients. A screening campaign had been organised and now, the project will be extended to various parts of Maharashtra. 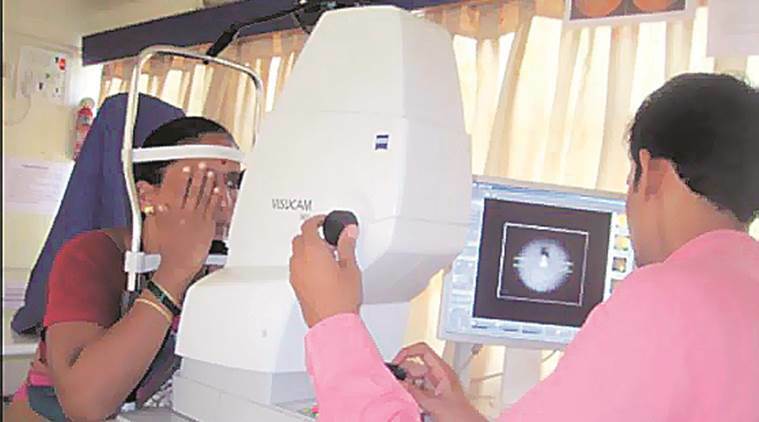 Natarajan, who is also the chairperson and managing director of Aditya Jyot Eye Hospital in Mumbai, said the All India Ophthalmology Society submitted a proposal to Union Health Minister J P Nadda recently on a nation-wide study on screening for diabetes and other eye complications. “According to recent reports, there are 65.1 million diabetes patients in the country. We are now toying with the idea of training non-skilled workers who have passed Class VIII and other volunteers to use hand-held cameras and undertake a basic screening programme to detect diabetes and related eye complications. Guidance will be provided at each stage,” Natarajan who has also embarked on a world-wide tour as part of the society’s Stop Blindness programme said. He added that dilated fundus examination was the standard method for diabetic retinopathy screening. Inadequate infrastructure and lack of trained ophthalmic technicians and high cost are restraining factors to screen a large number of people. Hence, in resource-deficient settings, the project will resort to alternatives like training non-skilled workers. An image of the retina will be taken and then read by an ophthalmologist through teleophthalmology and diagnosis would be provided. All those requiring further management will then be called on a pre-fixed day and place where an ophthalmologist would provide treatment in a van equipped with fluorescein angiography and laser. Further treatment can be provided at the hospital at an affordable cost. Early diagnosis and treatment of diabetic retinopathy can prevent vision loss and improve the quality of life, Natarajan added.